Replication to Premium Storage for VMware virtual machines/physical servers. Azure Storage Service Encryption (Encryption of data at rest) for storage accounts created using Resource Manager (in preview). Replication to Locally Redundant Storage (LRS) accounts. Support for all of these features delivers further on our promise of providing an enterprise-class, secure and reliable business continuity solution with support for heterogeneous workloads. You can now protect and replicate your VMware virtual machines and physical servers to premium storage accounts in Azure. With Premium Storage, your applications can achieve up to 80,000 IOPS (input/output operations per second) per VM and 2000 MB per second disk throughput per VM with extremely low latencies for read operations. If you are running I/O intensive enterprise workloads on-premises, we recommend that you replicate these workloads to Premium Storage. At the time of a failover of your on-premises environment to Azure, workloads replicating to Premium storage will come up on Azure virtual machines running on high speed solid state drives (SSDs) and will continue to achieve high-levels of performance, both in terms of throughout and latency. A premium storage account: When you replicate your on-premises virtual machines/physical servers to premium storage, all the data residing on the protected machine’s disks is replicated to the premium storage account. Data stored in this account is charged per premium storage charges. A standard storage account: After the initial phase of replicating disk data is complete, all changes to the on-premises disk data are tracked continuously and stored as replication logs in the standard storage account. Data stored in this account is charged per standard storage charges. This design of using a combination of Premium + Standard storage accounts therefore results in significantly reducing the overall costs, ensuring cost savings for your organization when using premium storage. Replication to premium storage is supported for both Classic and Resource Manager storage accounts. Replication to premium storage is currently supported for VMware virtual machines/physical servers. Support for replication of Hyper-V VM’s (managed by System Center VMM/without System Center VMM) to premium storage is coming soon. Watch this space for further updates on this. Virtual machines/physical servers replicating to premium storage can be failed over to the latest point in time or to a previous point in time (recovery up to 24 hours back in time). Retention of recovery points up to 24 hours is based on the number of snapshots per blob (100 snapshots per blob) supported by premium storage. On a failover to Azure, your application can only come up on DS or GS series Virtual Machines, which support premium storage disks. To failover to a DS/GS series VM, specify the required Azure VM role size under Compute Properties against your protected VM. 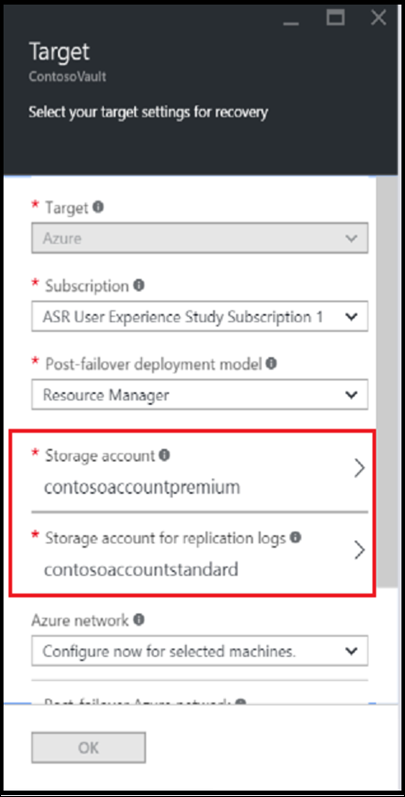 To understand more about how premium storage works, including performance and scalability targets of premium storage, you can refer the detailed documentation on Premium Storage from the Azure storage team. Azure Storage Service Encryption (SSE) for Data at Rest helps your organization protect and safeguard data to meet your organizational security and compliance commitments. Storage Service Encryption encrypts your data prior to persisting to storage and decrypts prior to retrieval. With ASR support for SSE, you can now replicate your workloads to storage accounts with SSE enabled. All encryption keys are stored, encrypted, and managed by Microsoft. We currently support replication to SSE-enabled standard storage accounts. Support for replication to SSE-enabled premium storage accounts would be made available soon. Watch this space for latest updates on this. This feature is supported across the entire matrix of our supported workloads including VMware virtual machines/physical servers, Hyper-V VM’s managed by System Center VMM, Hyper-V hosts without System Center VMM. This feature is only available for storage accounts created using Resource Manager. The experience when using ASR will not change when replicating to SSE-enabled storage accounts. As with most previews, this should not be used for production workloads until the feature becomes Generally Available. For a complete understanding of how SSE works and what is supported, please refer to the detailed SSE documentation from the Azure storage team. You can now choose to replicate your workloads to a Locally Redundant Storage (LRS) account. LRS replicates your data within the region in which you created your storage account unlike Geo-Redundant Storage (GRS), which replicates your data to a secondary region. With LRS, three copies of your data reside in separate fault domains and upgrade domains within the region. From a cost perspective, LRS works out to be much more economical as compared to GRS, and also offers higher throughput. In general, we recommend that you use a geo-redundant storage account (GRS) account as this ensures that your data is durable even in the case of a complete regional outage or a disaster in which the primary region is not recoverable. But if your application can be easily recovered during an Azure region outage or your data governance requirements restrict replication of data across regions, replication to LRS will work out to be better. For detailed instructions, check out our VMware and physical server scenario documentation and learn how to get started. Visit the Azure Site Recovery forum on MSDN for additional information and to engage with other customers, or use the ASR UserVoice to let us know what features you want us to enable next. Azure Site Recovery, as part of Microsoft Operations Management Suite, enables you to gain control and manage your workloads no matter where they run (Azure, AWS, Windows Server, Linux, VMware or OpenStack) with a cost-effective, all-in-one cloud IT management solution. Existing System Center customers can take advantage of the Microsoft Operations Management Suite add-on, empowering them to do more by leveraging their current investments. Get access to all the new services that OMS offers, with a convenient step-up price for all existing System Center customers. You can also access only the IT management services that you need, enabling you to on-board quickly and have immediate value, paying only for the features that you use.